visavietnam.net.vn - Mu Cang Chai is a rural district of Yen Bai province. The popular attraction of Mu Cang Chai in summer lies in its terraced rice fields, which draw a large number of both Vietnamese and foreign travelers. 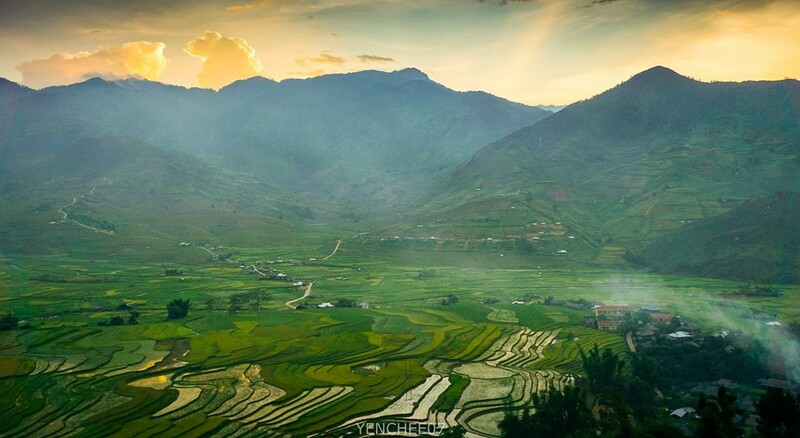 There are three most beautiful times to take photos of breathtaking terrace rice field in Mu Cang Chai: at the beginning of the crop, in the middle of the crop with amazing green terrace rice field and around the harvest time with beautiful golden terrace rice field. 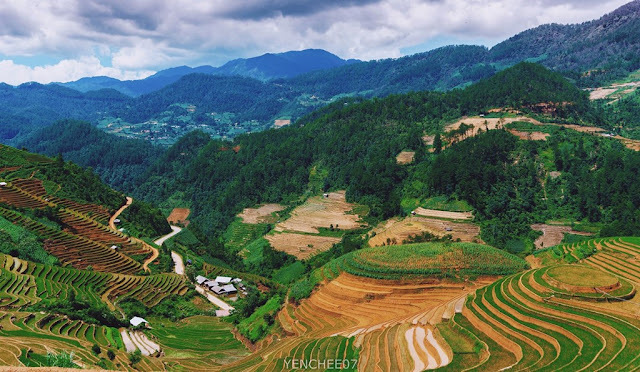 In June, when the first summer shower coming to the North of Vietnam, hill tribe people in Mu Cang Chai all come to their field for preparing the new crop of rice. 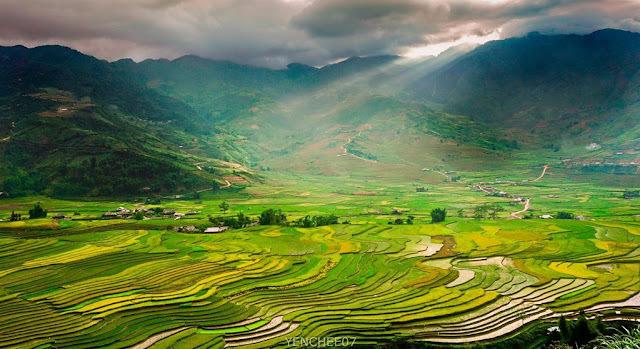 As all the field in Mu Cang Chai are terraced rice field so they all need to supply water from the top terrace of the field, and water from there just keep coming from top to the bottom of the rice field, and local people call this “falling water reason”. 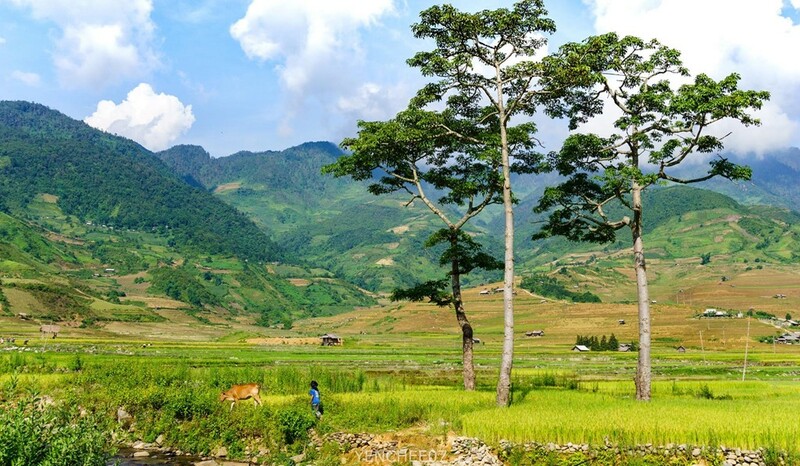 In this season, you will see activities of people working on the field, from ploughing with water buffalo to replanting rice. Normally they work in groups with very beautiful and colorful clothes of hill tribe woman, and it can be very interesting for very good photo shooting on the field in this period. The middle of the crop will be from June to mid-September. 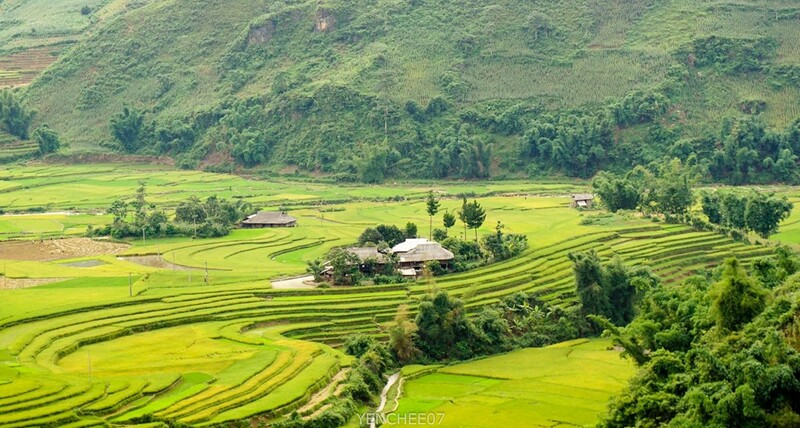 During this time, the whole tremendous terrace rice field in Mu Cang Chai will be covered by lovely and peaceful carpet of rice. You will not see much local activities on the field in this season, but the greenness of the rice field can be good compensation. 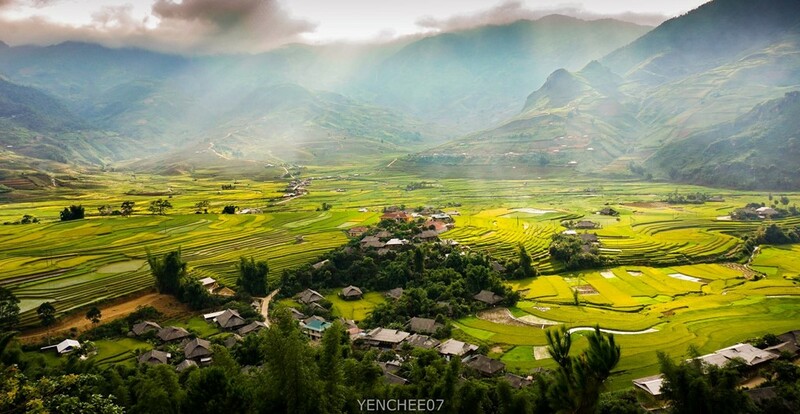 In the harvest time of the rice crops, travelers take the visit to Mu Cang Chai from late September to early October to see and take photographs of waves of terraced rice fields, as this is when the fields turn brilliant yellow and shine in their fullest beauty. 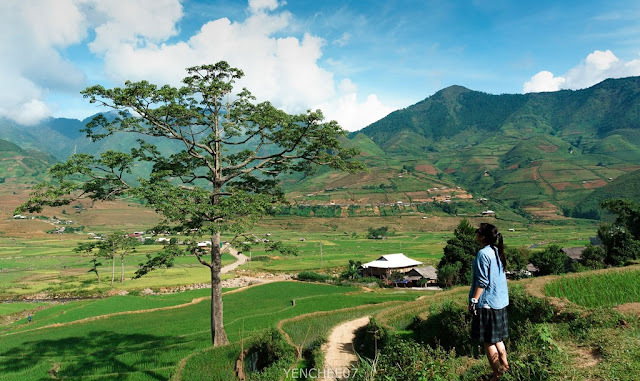 This is also the time when the fields become full of life as Mong ethnic minority farmers in their traditional attire harvest the ripe rice grains, and shoulder bags of the fruit home through mountains and hills as well as over swinging suspension bridges. 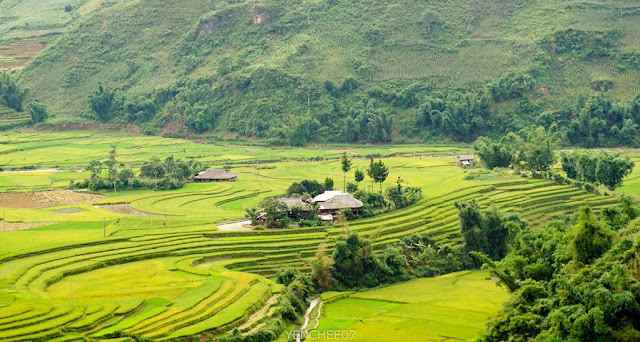 It is normal to see ethnic minority mothers use cloth as a cradle to carry their infants on their back when they are harvesting paddy in the fields in the northwest of Vietnam. Children of the farmers run here and there in the fields, chatting with their parents and giggling in tune with the joy of their parents during the harvest season. 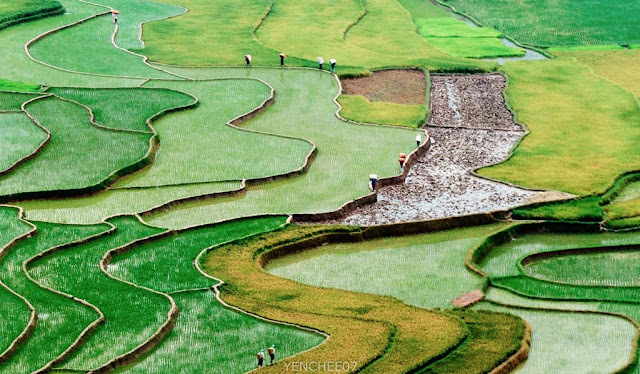 It is in late harvest season that visitors can distinguish the atmosphere of terraced fields in the rice harvest season and off the season. The real charm of yellow fields and the fields without paddy, and above all the type of soil and the attempts of the farmers to produce paddy, are most obvious at this time. Great time to collect beautiful pictures! 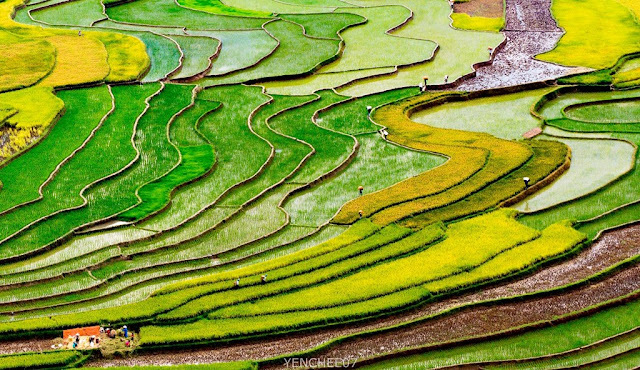 Let's see the beauty of Mu Cang Chai terraced rice fields in June or the rice crop, which takes place from June to October.